The nation remembers the tragedy at Columbine--the school killing spree that left 15 dead and 21 injured at Columbine High School in Littleton, Colorado. James Garbarino -- a national expert on youth violence and author of Lost Boys: Why Our Sons Turn Violent and How We Can Save Them -- talked with Education World, offering ideas about how we can make our schools safe again. James Garbarino, a national expert on youth violence, talked with Education World. Garbarino offered his insight as a psychologist who has worked with violent children for 25 years, trying to unravel the reasons they kill. Garbarino is the co-director of the Family Life Development Center and a professor of human development at Cornell University in Ithaca, New York. 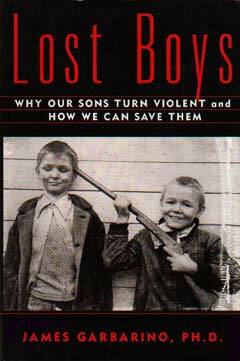 More about the epidemic of youth violence and possible solutions can be found in his book Lost Boys: Why Our Sons Turn Violent and How We Can Save Them (Free Press, 1999). Education World: Why do you think the tragedy at Columbine High School shocked the nation the way it did -- prompting changes in school security and new programs to prevent violence -- considering there have been many other episodes of school violence during the past 10 years? James Garbarino: I think the magnitude of the event (13 murdered, two dead by suicide) combined with the timing (at the end of a school year that seemed quiet after the previous years' school violence) shattered people's complacency. EW: For parents and teachers, is there a way to profile a child who is at high risk to kill others? Are there any signs teachers and parents should look for that might help prevent more killings? Are there violent kids who don't fit the expected profile of a violent child? Garbarino: I think about 90 percent of kids who kill seem "easy to explain" in the sense that they come out of a background of abuse, neglect, community violence, and escalating social difficulties, all within the context of our socially toxic culture. The other 10 percent seem to come out of nowhere. They seem to reflect serious temperamental difficulties, leading in some cases to clearly disordered thinking and feeling, coupled with peer influences in our socially toxic culture. EW: Can you define "socially toxic environment" and explain why your definition includes kids who come from homes with economic advantages? Garbarino: My 1995 book, Raising Children in a Socially Toxic Environment, deals with this issue. Just as the physical environment can become poisoned, so the social environment can as well. In the first case, it is lead and PCBs; in the second it is violent images, broken relationships, and spiritual crisis. In both cases, some kids are more vulnerable than others. EW: You've been talking to kids who cause lethal violence for years now. What about their stories affects you the most? What have you learned from talking to them? Garbarino: I am most affected by the pain and suffering so many carry with them each day. I have learned that the social dangers of our society -- drugs, violence, delinquency, inequality -- are tolerable if you have everything else going for you -- a healthy family, positive temperament, good education, spiritual grounding. But if you are vulnerable, it is a dangerous society because you are likely to be "infected" by the social toxicity and do harm to yourself or others or both. EW: How can we make our nation's schools safe again? Can you offer some specific changes that you believe would help prevent more school violence? Garbarino: Smaller schools, more consistent commitment to character education and spiritual development, better lines of communication from kids to adults, absolute banning of guns for kids, violence prevention programs that change thinking and offer practice in changed behavior, and stronger mental health services starting in the early years -- all those would make a difference. EW: Most of us just don't understand why kids kill other kids. How do you explain it? Garbarino: I think it is so difficult to understand for several reasons. First, it is a rare event. Second, most people assume killers are a foreign breed, aliens. When we see kids, we have a tough time seeing them in that category. Third, from an adult perspective, much of what kids worry about seems trivial, and we have a hard time taking it seriously. Thus, we find it hard to understand why they would kill over it. EW: In your book, you describe several factors that contribute to boys' violent behavior well before the child has entered the public school system. They enter school like, as you call them, lost boys. So what can a school system do in those cases? Is the Teacher in the Classroom Next Door a Convicted Felon?